Here is a list of best websites to watch Hindi movies online for free & legally in HD without downloading. In fact, few of them don’t require registration also. I added only best websites having fewer ads & popups and organized layout. YoMovies is a place where you can watch from old to latest new release hindi movies for free without signup. For old movies video quality is superb. In case of new release movies, it is okay. YoMovies layout is very organized and you can easily found a movie you are looking for. Apart from Bollywood movies, it also lets you watch Hollywood movies, Hollywood Hindi dubbed movies, South Indian Hindi dubbed movies, Punjabi movies, Telugu movies, Tamil and 18+ movies. Every movie is listed with basic info like cast, movie type, movie trailer link. Best thing about YoMovies is that it has 2 streaming servers, if one doesn’t work, you can watch a movie with the second option, no need to search another YoMovies alternative. HindiLinks4u is a good platform to watch latest Hindi movies and Hollywood movies in Hindi dubbed free online without downloading and registration. It lets you browse movies by actors, actress, directors, release year and genres. Under every genre, it has a large number of movies to watch. It has 3/4 streaming servers which you can use to stream your favorite movie. Available Videos quality is high definition. It also contains advertisements which is usual in case of free movie websites. Furthermore, it features documentaries and lets you download movies with Internet download manager. Fmovies is one of the best movie streaming services which allows you to watch latest Hindi movies online and TV series like sacred games for free. Registration is not required. Videos quality is high definition. All movies are available to watch for free. And movie database is quite huge, it seems never-ending. It has some ads and popups but no misleading sign up and download button which makes it best free movie streaming site. It has only Bollywood movies. If you want to watch other regional language movies, move to the next website. If you liked Fmovies and check out this article to know similar websites like Fmovies. Voot is another great streaming platform which not only allows you to watch Hindi movies online free but also offers a huge collection of popular TV shows in Indian Cinema like Bigg Boss, Splitsvilla, Naagin, Ace of Space and many others. Voot has a great collection of popular Hindi movies, Kannada movies, Bengali movies, Tulu movies, Kids movies. Every section of movies has a vast collection of movies. Voot organizes TV shows on the basis on channels. At compiling time of this list, it has 23 TV Channel shows which you can watch without sign up and paying nothing. Yes, it is totally free. Hotstar is the no.1 choice of many movie buffs to watch free Hindi movies online legally. HotStar is not completely free but it offers you a great number of movies to watch without paying anything even that too in high definition quality with fast streaming. Signup is optional. It also allows you to watch popular TV shows offered by 30 different channels including Star Plus, Foxlife, National Geographic, Hotstar Picks and Life Ok etc. Apart from Hindi movies, it also has Bengali, Telugu, English, Gujarati, Kannada, Marathi, Malayalam, and Tamil movies. It also allows you to watch live sports like Cricket, Football, Hockey, Tennis and many others. In addition to that, News section is also here where you can listen to news using different TV channels like ABP news, Aaj Tak, News Nation, and Republic TV etc. It also has its own iOS and Android apps. If you opt for a premium subscription which charges are Rs. 999/ year and Rs. 199/month, you will never look further for any streaming source. Since you got everything here from movies to TV shows, sports, news. Check out this post to know more legal movie streaming sites like HotStar. GoFilms4U is a perfect place to watch Hindi movies online free in HD without registration. Yes, it is totally free streaming site and it allows you to watch full-length movies. You can browse Hindi movies on the basis of released year. Apart from Hindi movies, it also offers a facility to watch Hollywood, dubbed, Tamil, Telugu and many other Indian languages. While you click on play button to stream movie video, you need to close one or two pop-ups. After that, you can enjoy your movie without any hindrance. Here you get a wide range of choices to choose a movie like multiple subcategories of genres, release year, countries and movie quality. UI is very clean and well managed. YesMovies lets you watch Bollywood movies without registration into high quality but it has more ads and pop-ups as compared to other movie sites. Apart from Bollywood movies, it also lets you watch 12 other countries movies. Additionally, it offers a wide range of TV series. 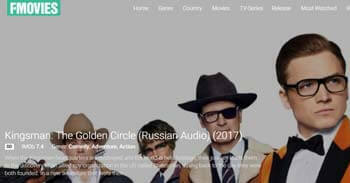 The website layout is professionally designed to keep users all requirement into the mind like filter options (genre, country, Top IMDB), request facility, and search bar. Using all these options, you can easily search a movie which you wish to watch. It showcases all the essential information about a movie. Overall, it is a good place to watch Hindi movies online free in HD with interruption of advertisement. Zee5 offers a wide selection of hit Bollywood, Hollywood and Regional movies to watch online for free. Some movies are tagged with Premium, you can watch them only with premium account. 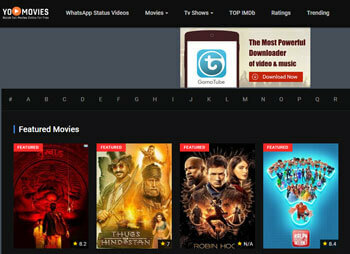 Apart from premium movies, it has thousands movies and TV shows which you can watch in free even without doing sign up. If I talk about streaming, it is fast (depend on your internet connection) as compared to many other free movie sites. Video quality is awesome, you are going to love this. Apart from movies, you can watch Zee5 channel TV shows of several Indian languages like Telugu, Kannada, Tamil, Marathi, Bangla and more. Overall, it is perfect choice to watch Hindi movies online free without downloading high quality. SonyLiv is next choice to watch online Hindi movies for free without downloading. It is premium video streaming site but it lets you watch thousands of full length movies and shows for free online. Here you can sort movies by languages and genres. Furthermore, it allows you TV shows streaming, sports streaming and several channels streaming including Sony MARATHI, SET HD, SAB HD, News, MAX HD, Sony BBC etc. YouTube is one of the most popular platform for entertainment. If you love to watch classic movies, then you can consider YouTube as a best source to watch Hindi movies online. Sometimes you can find new movies also here but it is exceptional case only. Account creation is optional in order to stream your choice movie online. Below are the links of two popular YouTube channels which share classic movies. If you are in mood to watch any specific movie, use YouTube search bar by entering movie name. Once you click at enter button, it will show you a list of relevant results. If you find, it is amazing otherwise move to next listed movie site. If you love to watch short funny videos, then you will love below YouTube channels also. You will find many other channels which are popular to make people laugh. Above three are my favorite. An ondemand video streaming service to watch movies (Bollywood + Hollywood), TV shows, Trailers, music videos, short clips and more. In order to stream movie at JioCinema, you need to create an account with Jio Number. It allows you to watch from latest releases to old classic films. In fact, you can find all popular comedy TV shows here including The Kapil Sharma Show, Comedy Nights Bachao, Comedy Nights with Kapil, Comedy Nights Live and more. Some amazing features of JioCinema are resuming watching content, HD quality videos, no advertisement popups, searching with different filters like genre, starcast etc. For music lovers, it offers a vast library of music videos from popular artists like AR Rahman, Vishal Shekhar, Beyonce, Mohit Chauhan, and Sonu Nigam etc. If you are ready to invest some money for entertainment, YuppTV is best solution for you to watch Hindi movies online. It is one of the world’s largest streaming platforms and providing 4000+ TV channels, 5000+ Movies & 100+ TV shows in 17+ Indian regional languages. It also allows you to enjoy Live TV and Catch Up TV. It supports six screens namely Internet STBs, Smart Blu-ray Player, Tablets, Smart Phones, Laptop and PCs. Furthermore, it lets you watch latest released movies as they appear in theaters, YuupTV named it Mini Theater. They claim they offer 14 day free trial but I am not sure about their free trial. Because after creating account at YuppTV.com, I tried to watch movie. And I noticed I need to subscribe for a plan which will cost me 6.99 USD and I can’t see any note here regarding free trial plan. While things are different in case of YuppTV.in, here I noticed a note for 15 days free trial, after creating account here, I am able to stream content. But feature like Mini Theater is missing here. For more information, you can visit above give official website links and register yourself to explore content at YuppTV. Spuul is an over the top streaming service for watching and downloading full length movies, short movies, and TV shows in several Indian regional languages. It offers its service worldwide. It is premium movie streaming site. Hence you need to subscribe premium plan which cost you 99 INR/month and 999 INR/year. Premium plan doesn’t include rental movies. To watch rental movies, you need to pay for every movie separately. Spuul supports multiple devices including Android, iOS, smart TVs, web browsers, and Chromecast etc. It lets you stream 20+ channels and a few TV shows Catchup with free account. Follow this link to watch free channel. For TV shows, you can browse TV shows section. Hungama is India’s most popular digital entertainment company. It is known for music tracks, movies, TV shows, music videos, dialogues, ringtones and more. It has 2.5 million pieces of media contents. It is available on mobiles, tablets, PCs, connected TVs and more. It is not only the place to watch hindi movies online but you can stream movies of other regional languages like English, Punjabi, Telugu, Tamil, Kannada, Malayalam and more. Apart from online streaming, it offers you downloading facility also. Registration is not needed to watch videos and listen to music. If you love listening to music and watching movies, Hungama is perfect choice for you. You can download Hungama app from Google play store or official website to enjoy movies and music at your phone with ease. HDFriday allows you to watch Bollywood, Punjabi, South Hindi Dubbed, Hollywood movies and more online without registration. If you love to watch Hollywood movies in Hindi, you are going to love this movie website. It has a vast library of dubbed movies in Hindi. Also it offers downloading facility. Only use magnet link to download files. You can explore movies using genres and category section. If you are ready to invest some money, then check out these best Netflix alternatives. Now, I have reached the end of the list. All these are my favorite websites to watch online Hindi movies for free without downloading. Did I miss any best website that deserves a place in this list? Let me know your thoughts by doing comment below now. here you can watch Latest Hindi Full Movies Online Free, Dubbed in Hindi Movies, Indian Documentaries, TV Shows and Awards and more.